If you're like most people who overindulged the last few months, you may be trying to start the year with a healthier, active lifestyle. After the sweets, alcohol and abundant food of the holidays, the gym looks more appealing and you feel committed to eating lean, clean and green. So how do you keep that momentum going when it comes to travel? As someone who loves eating new foods and trying a culture's cuisine, I have admittedly often had the mindset of "I eat whatever I want" on vacation. That lean, clean and green eating plan goes out the window as I grab a baguette with cheese in France, churros in Spain, pasta in Italy and so on. When in Rome, right? I'm all about mindset and believe many things in life can be accomplished when you're mentally committed to it. Or at least try to be mentally committed. Being active and healthy is one of those things. Instead of having a mental on and off switch when it comes to your home life versus travel life, try to continue to keep the "I'm living healthy" mindset with you. It's the difference between a lifestyle and a diet (at least that's what they say!). So you're at a hotel where there's a breakfast buffet... STOP. Step away from the bacon. I repeat, back away from the bacon. Instead, start off with a bowl of fruit, Greek yogurt or a healthy omelette (egg whites, vegetables, etc). Then, afterwards, see if you still want the bacon. If you do, I say grab a slice, but probably by then you're more full and less likely to gorge on the unhealthy stuff. Same goes for lunch and dinner — start with a healthy salad and then go from there. Related to the above tip, I'm a big believer in balance. I can't eat salad all day, every day; I just can't. Especially if I'm somewhere that's known for their cuisine. I'm pretty sure it's a crime to not try cacio e pepe while in Rome and only opt for the lettuce — which is why it's all about balance. Should I eat cacio e pepe every day? No...no, I probably shouldn't. But if I try to keep it healthy before or after the cacio e pepe, then that's not so bad. Right? Right. When traveling to a different place, one way to stay active is to look for outdoor activities you can do. It could be going for a nearby hike or swimming at the beach or in the pool. Even a walk through the park or around a new neighborhood is a great, low-impact way to be active. There may even be fun outdoor fitness classes you can sign up for. 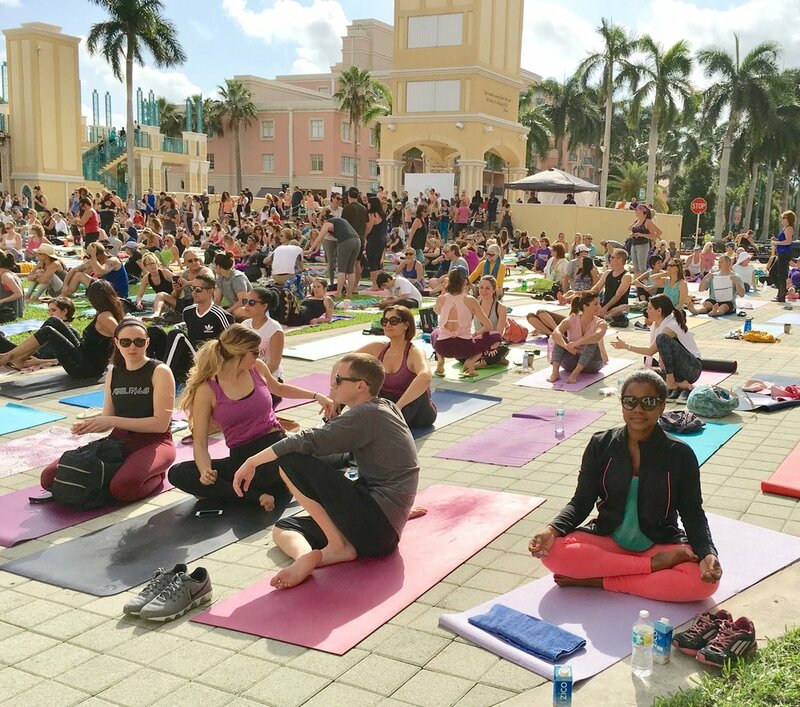 I recently did a yoga in the park class with 1500+ people, and it was an amazing way to experience something new while being active at the same time. And, it was free! Just make sure to have the appropriate shoes and clothes on hand. 5. Try Free YouTube Workout Videos! Speaking of free activities, for those seeking a more intense and high-impact workout, there are literally hundreds (probably more like thousands) of free fitness videos available on YouTube. How do I know this? Because I use them regularly, particularly when it's freezing outside and I want to work out but don't want to leave my apartment. Or, if I'm in a hotel room and don't want to use a machine in the hotel gym. My favorite workout YouTube channels are Tone It Up, Fitness Blender, PopSugar, BodyFit By Amy and Sarah Beth Yoga. Many of them don't require weights or equipment, just you, a towel and water! With these five tips, you can stay on track while you travel the globe. It's basically two New Year's resolutions in one! Do you have tips for staying active and healthy on the road?